Weisz Accounting Services is a family owned and operated business that has been in existence since 1952. 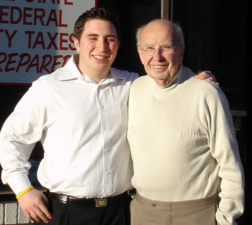 Over the past 59 years, Richard Weisz (and more recently Jason Weisz) has been able to provide comprehensive tax preparation to individuals and their families throughout the greater Philadelphia and South Jersey Region. Currently, the company services taxpayers from all over the U.S. In 2002, Jason Weisz was brought into the business and, in 2006, had the opportunity to take over. Since he has been owner, he has transformed a once, carbon-copy paper business, into an integrated computerized accounting business. In addition, due to a high demand from their current client base, Weisz Accounting Services has transitioned to a larger, more private office in order to continue to offer the same high level of customer satisfaction their clients have grown accustom. We plan to expand our operations to include comprehensive tax planning, financial and estate planning, bookkeeping and recordkeeping accounting services, and small business consulting. Grandson of Richard Weisz, Jason graduated George Washington University in 2001 with a degree in Finance and Economics. Immediately after college, Jason took a job as financial planner specializing retirement planning for employees of the public school system in Washington, D.C. and the surrounding area. He still has his Securities and Life and Health Insurance Licenses in order to act as a registered representative. He is currently partnered with Keystone Financial Services to offer a complete financial planning service to his clients. After deciding to move back to the Philadelphia area, Jason decided that he would concentrate his efforts on helping service his grandfather’s clientele (Richard Weisz). After working closely with Richard, he found his true passion was in Accounting. In 2002, he was brought into the firm to be groomed as the eventual successor. During his time with the company, he has become an Enrolled Agent with the IRS, and has also completed all four parts of the CPA exam. During the past 13 years, Jason has continued with his efforts to make Weisz Accounting Services a full service firm and provide the clients with a comprehensive perspective to tax planning and preparation.